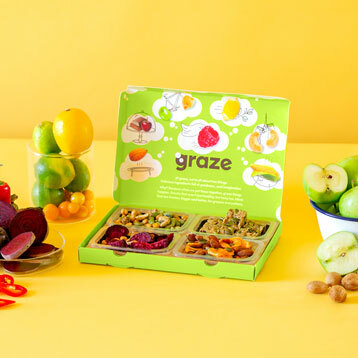 At graze we’re on a never-ending hunt for healthier, juicier, crunchier, tastier, fresher, bigger, better - for the love of delicious and ingredients, and for the benefit of grazers everywhere - so you can enjoy new snacks every week. 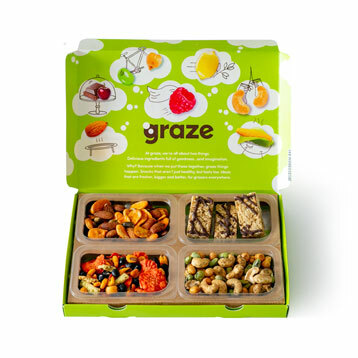 To try a graze box, arrange a chat, or find out more just email getintouch@graze.com. 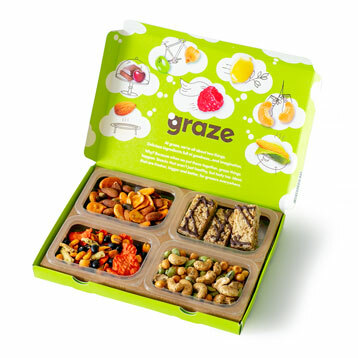 No one was making healthy snacks worth getting excited about, so in 2007 we started experimenting with our own flavour creations - graze was born. Over the next year we started posting the first graze boxes, and by 2011 we had 100,000 grazers getting our snacks every week! In 2013 we set up our Stateside headquarters in NYC so we could send our boxes to American snackers. 2015 saw us launch our snacks in shops across the UK in their snazzy new sleeves, and it wasn’t long before the US wanted some of the action too. Next stop, the moon!